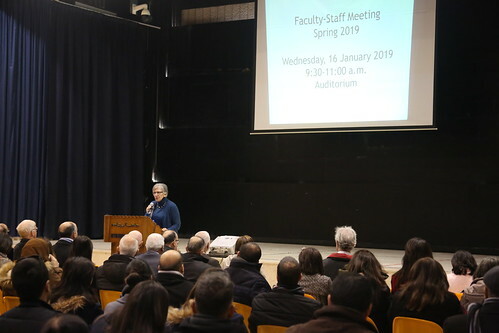 Bethlehem University faculty and staff gathered for a meeting on Wednesday, 16 January 2019, after the Christmas and New Year’s break to mark the beginning of the new Spring 2019 semester. Vice President for Academic Affairs Dr. Irene Hazou presided over the meeting which began with a reflection by Brother Peter Iorlano, Coordinator of Institutional Values. Dr. Hazou gave Vice Presidents and Deans the opportunity to introduce new faculty and staff members to their colleagues. Vice Chancellor Brother Peter Bray highlighted in his speech the strategic plan and the preparations for 2023 which marks the University’s golden jubilee. Brother Peter added that the challenge is to empower students emerging from Bethlehem University with the knowledge, attitude, and commitment to make the world a better place through implementing the strategic plan. Important updates from the Vice President for Financial Affairs Mr. Youil Anastas, Vice President for Human Resources and Administrative Affairs Brother Stephen Tuohy, and Vice President for Academic Affairs Dr. Irene Hazou were also presented. Our best wishes for a successful Spring 2019 semester.